Laid down at Northumberland Shipbuilding Co. Ltd., Howdon as Yard Number 186, a 4220-ton cargo ship. Completed and sold to Gulf Line Ltd (Furness, Withy & Co., Ltd), West Hartlepool. Arrives at Ellis Island from Cardiff, Wales. Arrives at Ellis Island from Cardiff. Arrives at Ellis Island from Cardiff via Queenstown. Arrives at Ellis Island from Hull, England. Arrives at Ellis Island from Fayal, Azores. Arrives at Ellis Island from Le Havre, France and Havreo, Portugal. Arrives at Ellis Island from the United States. Sold to T Yamamoto, Dairen, Manchuria. Renamed RYOKAI MARU. Mindoro, Philippines. RYOKAI MARU is stranded on Panagatan Reef. Later, salvaged by the Atlantic, Gulf and Pacific Co. of Manila. Sold to Yamamoto Kisen K.K. of Dairen, and Kobe, Japan. RYOKAI MARU departs Singapore under charter to Osaka Shosen Kaisha K. K for Osaka and Kobe. Singapore. Dry-docked at Keppel Harbor. Sold to Nippon Godo Kisen K. K, Kobe. Sold to Kyodo Gyogyo K. K, Kobe. Sold to Nippon Suisan K. K, Kobe. Converted to a crab factory ship. Chartered to the Imperial Army (IJA). RYOKAI MARU departs Osaka in a convoy also consisting of AIDA, ASO, CHICAGO, JILIN, KOSOKU and MAYA MARUs and an unidentified ship. RYOKAI MARU is carrying part of the 14th Division's 1st battalion, 59th Infantry Regiment, 1/2 of the Infantry Gun Unit, 1/3 of the Mountain Gun Unit, 2nd Infantry Regiment and part of 20th Field Artillery Regiment and 14th Engineer Battalion. Arrives at Wusung and departs. RYOKAI MARU departs Wusung carrying the 1st Battalion, 24th Infantry Regiment, 24th Mixed Brigade. Requisitioned by the Imperial Navy (IJN) as a (B-AK) Ippan Choyosen. Singapore. The British Consulate lists a number of Japanese ships and tankers on Britain's shipping “Black List”, including RYOKAI MARU, suspected of provisioning andrefueling Nazi surface commerce raiders. 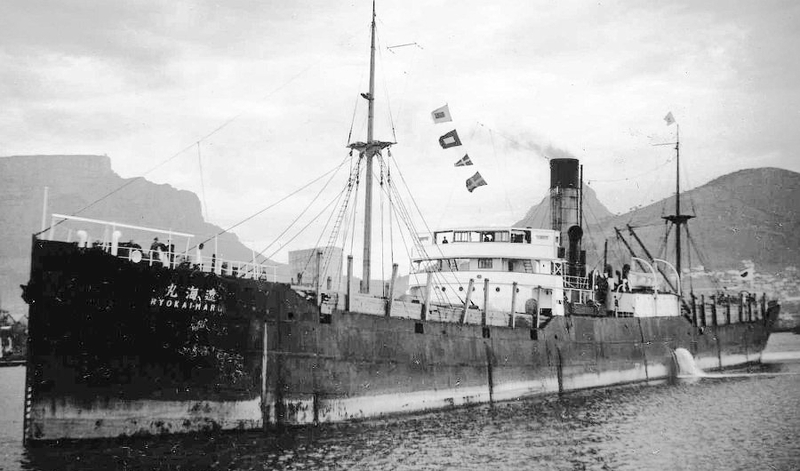 2 December 1942: RYOKAI MARU departs Wada-Misaki, Kobe in convoy No. 32 also consisting of HIKOSAN, KOJUN, TSUKIKAWA, YAMAFUKU and ZUISHO MARUs and auxiliary transport HAKUTETSU MARU No. 7 escorted by destroyer OKIKAZE. Lookouts on Cdr Dudley W. Morton’s (USNA ’30) USS WAHOO (SS-238) pick up three freighters in column making 7 knots at 43-24N, 140-26E. At 0035, WAHOO fires one unreliable Mark 14-3A steam torpedo at the trailing ship, but there is no detonation. RYOKAI MARU departs Suttu, Hokaido for Niigata carrying a cargo of salted fish. Sea of Japan. At 1433, LtCdr (later Rear Admiral) Raymond H. Bass' (USNA '31) USS PLUNGER (SS-179) fires three torpedoes at RYOKAI MARU and gets three hits starboard side. One of the Mark 14-3A torpedoes is a dud, but the other two explode and within three minutes RYOKAI MARU sinks at 43-24N, 140-26E. Casualties are unknown.